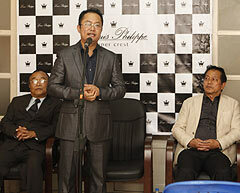 Aizawl, May 18 : Louis Philippe, the identity of the stylish and astute Indian gentleman launched a brand new store at Zarkawt, Aizawl. The brand new store was inaugurated by chief guest Pu Lal Thanzara, Honourable Parliamentary Secretary (CMO), Government of Mizoram. The range of products on offer is a delight for the experimentative and fashionably discerned populace of the city. Choose from a delectable assortment of men’s apparel and accessories ranging from ceremonial and corporate suits, blazers, shoes etc. Engage your fashion senses as Louis Philippe enthralls with its classy and exclusive offerings. Since its foray into the Indian market in 1989, Louis Philippe has successfully established itself as the premium menswear brand in the country. The brand has been on an aggressive expansion spree and the success story continues with the brand launching its latest flagship store in Aizawl which is definitely a milestone in the city’s fashion culture. The latest addition shows the importance of the North Eastern region in the brand's distribution strategy. The brand has also been on an aggressive expansion spree and aims to increase its presence by opening more stores and with focus shifting to non-metro markets. The story continues with the brand launching its latest flagship store in Aizawl which is definitely a milestone in the city’s fashion culture. So come be a part of the celebration as Louis Philippe ushers in a new wave of class meets panache in the wonderful city of Aizawl.